Moving outside the realm of reality with Watergh0st. There are plenty of times that the descriptor “ghostly” gets thrown around in music. But, it's not too often that the spirit tying together a series of songs is able to evoke feeling without the use of physical form. It's as if the artist is spinning a whirlpool of organized chaos to create a beautiful collective of thoughts instead of the linear narrative that's forced upon us. Watergh0st's Compilation takes this sort of beautiful reel-to-reel sounding soul fragment and runs with it into the afterlife, collecting all the memories there before returning with them here, as a haunt, to remain with us while we listen. This EP is not lo-fi by any means, but parts of it do feel like a tape copy of a copy of a tape, with the reels bouncing off each other to create rhythms to hold us until the drums come in. The tracks are typically short and usually without vocals. This is 3 AM music, or at least music you listen to when you are outside of time, still living in that liminal space before the sun rises again. 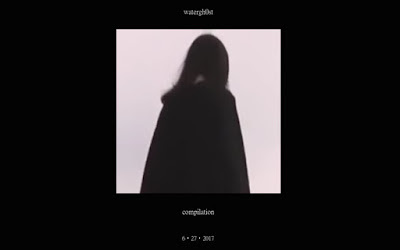 This compilation of music almost acts as the “interlude” parts between other songs on other records; it reminds me of the weirder, more abstract sections of Grimes or Bjork records. Except while those fragments are potentially experimental filler, Watergh0st has already explored all of these floating carapace lands, and has made home there. It's like finding relief in the supernatural dreamscapes that you might find underneath the forgotten level in a bugged car racing videogame, having driven into areas you weren’t supposed to, stretching the experience into a surrealist art portal. The standout track is the album's last, a short drum‘n bells piece called “Dusk.” It ends in a way that sums up the entirety of the records; unsettling but accepting its nature, finding peace and power within it. This is a stellar release, good as a companion on midnight drives, or alone at home with a candle and a mirror. Much like the void; when you look into this music, it looks back at you. Listen to Watergh0st on bandcamp.